Florida Governor Charlie Crist is not a details guy. No matter how big the issue, he leaves it up to others in the legislature or elsewhere to work out the fine print. You'll never get bored listening to him rattle off intricate policy proposals, because he just doesn't do that. But that hasn't necessarily been a hindrance to him. I hesitate to compare him to Ronald Reagan, but Crist is similar in the sense that a top political executive can concentrate on a few big ideas and leave it to the little people to work things out. 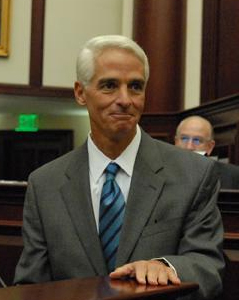 You could make the case that Crist can seem disengaged, not deeply committed to core ideas. But by not being hindered by an overly complex view of the world, Crist has been able to score some big wins. U.S. Sugar Senior Vice President Robert Coker said the plan originated with Crist last fall in a meeting with company representatives in Tallahassee when the governor made a statement seemingly out of the blue: "I just think we ought to buy you out." Said Coker: "I was very surprised. I've been dealing with Everglades issues for 27 years with this company, and nobody's ever taken that kind of bold stroke, to say we're going to solve this thing once and for all." Florida had already been taking advantage of depressed land prices to buy up land for conservation. Crist probably had that fact somewhere in his mind and, confronted with this environmental problem, just blurted out, what the heck, we'll buy that land, too. Now the environmentalists who were mad at him for caving to the McCain campaign on offshore oil drilling are once again singing his praises. "It's monumental," Crist said in an interview. "It is breathtaking in its scope. I am overwhelmed with joy about the possible benefits." History will tell if Crist can succeed where generations have failed in restoring the Everglades. But his move cements his legacy as one of the state's most ambitious governors, willing to leverage his personal popularity to scale mountainous issues.